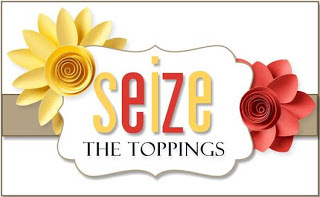 This time around the "Toppings" options is a color challenge: black, white plus a splash of any one color. 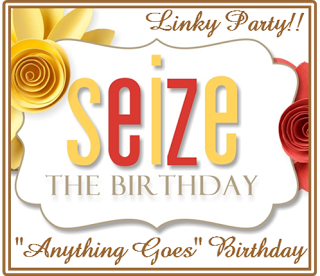 You can also chose to do an Anything Goes birthday card, the choice is yours! I went with the toppings option, and what a surprise, florals. I thought the sketchy look of the Painted Flowers stamp set would lend itself well to leaving the leaves colorless. The blossoms were stamped in two close shades of yellow, apparently a bit too close as they blended as the ink dried. That's ok, this was supposed to be only one color plus black and white anyway! I did a bit of ink splattering on the background which is always a messy job for me. The ink tends to go everywhere, even on unintended cards if they are too nearby. No injuries this time. I'm also adding this to the gallery at The Flower Challenge, where it is anything goes this month. Hi Sandy, I like the yellow and black and the sequins. I always forget to add them. This is beautiful! I need to play with this set...you make it look so easy! And I do need more birthday cards, I must play along! Have a great weekend, stay warm! Beautiful. Love the yellow flowers and the colorless leaves. :) Have a great weekend. This is beautiful Sandy! When I splatter it goes everywhere too! You think I would learn to put up a paper wall or something to contain the splat....but I don't. Really love your flowers! HUGS! I think you made the perfect choice with those painted flowers, Sandy! The ink splattering adds just the perfect touch to the background. Love it! Ohh!! I've been eyeing this Altenew set for a while and now, I want it!!! Your card is so beautiful in those soft Spring colors, love the layout and the bling of the sequences. 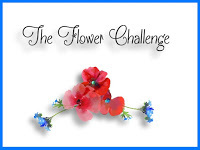 Thank you for sharing with us at THE FLOWER CHALLENGE, hope you join us again next time. Your roses are so lovely in soft yellow! And the black splatters give the card an artistic look! Btw I love this stamp set :)! Thank you so much for sharing this with us at The Flower Challenge!